Cafe Menu — Brooklyn in Helsinki. Fredrikinkatu 19 00120 Helsinki and Otaniementie 14 02150 Espoo (at Aalto Unviersity in Otaniemi). Every day we bake fresh from our original recipes. All of our food and drinks are inspired not only by life in Fort Greene, Brooklyn, but by all of our travels across multiple continents, books read so many times the pages are worn or from a memorable family party from years ago. Brooklyn Cafe at Aalto University in Otaniemi offers popular items from the original cafe in addition to delicious Harvest Bowls and Signature Salads for lunch. Also, Brooklyn Cafe at Aalto has unlimited Pancacke Brunches on Saturday. We only use Dark Roast coffee and Espresso (we really like tasting the coffee with our milk!). Our Filtered Coffee is our own private label, Fulton Street Blend. You can even take this delicious coffee home by purchasing 250g of packaged beans from the cafe, or ask for one of our awesome staff to grind it for you. Heavily influenced by living and traveling in Italy, we use a Dark Roast, full-bodied espresso Made in Italy. We have plenty of Milk options to compliment your coffee & espresso drinks: Full Fat, Fat-Free, Lactose-Free, Soy and Oat Milk. There is no Brooklyn Cafe without the bagels. 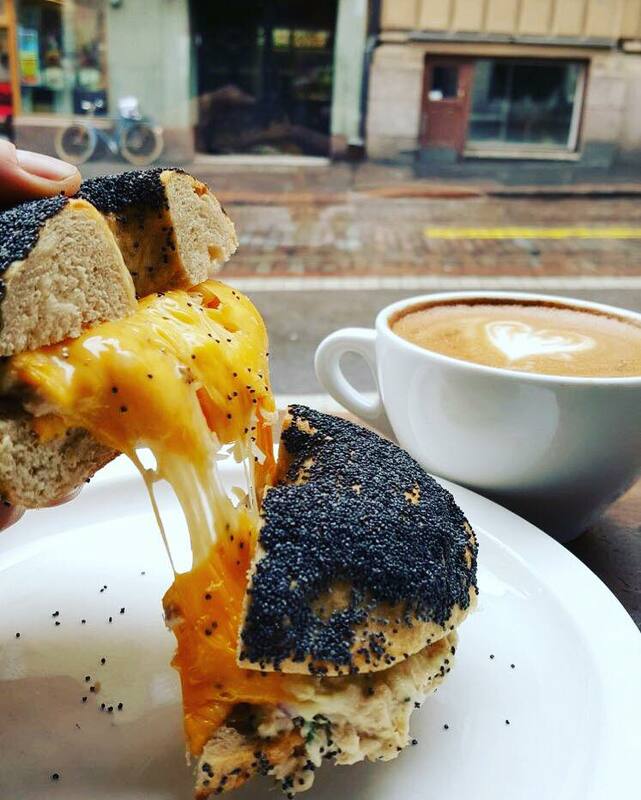 We have 6 different bagel types, with over 10+ fillings to choose from, including Vegan & Vegetarian options. If you haven't tasted our bagels yet, we suggest that you start with a Toasted Bagel with Cream Cheese, a classic way of enjoying a bagel! If you would like something more substantial, choose from other options to include those with Avocado, Various Cheeses, Prosciutto Ham, Tofu Scramble and much more. Other popular food items include our vegan Waffles with Fresh Berries (and a side of maple syrup), Fresh Salads and Avocado Toasts. Desserts are a huge hit at the cafe, especially our cupcakes. Our cupcakes became so popular over the years, that we had to open our bake shop, Brooklyn Baking Co., right down the street from the cafe. Aside from cupcakes, you have freshly baked Cookies and other desserts to choose from. All sandwiches can be made Gluten Free with our delicious G.F. toast. A Gluten Free Cupcake option is available daily as well! 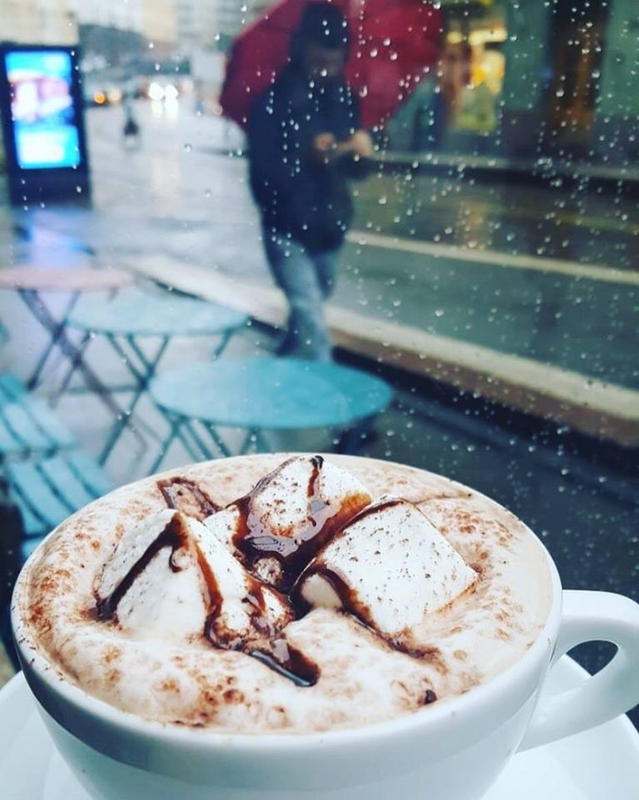 Hot Cocoa w/Marshmallows on a rainy day. This is where we have a lot of fun. We have delicious hot drinks from our traditional Hot Cocoas, or our popular Mexican Hot Cocoa. We also offer Chai Lattes, Matcha Lattes and Seasonal Drinks such as Pumpkin Spice, Gingerbread Latte & Apple Pie Cider. Don't worry Tea drinkers, we've got you covered. Choose from over 7 different loose leaf options. If you want to take it up a notch, try our London Fog, an Earl Grey Latte. We offer Smoothies that we make daily with fresh veggies and fruits. Freshly squeezed Orange Juice is also available. And for you Soda lovers, we do offer a small can of Coca Cola in the self-service fridge. Summer is not the only time for Milkshakes, we offer 3 different flavors: Vanilla w/Toffee Drizzle, Chocolate & Chocolate and Oreos Cookies Milkshakes. Iced Coffee Drinks and Tea are also available all year round.